The Ray Miller Trailhead in Pt. 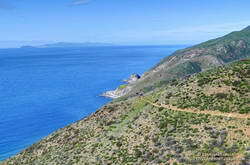 Mugu State Park marks the western end of the Backbone Trail, a 68-mile scenic trail along the spine of the Santa Monica Mountains. The Ray Miller Trail’s long, winding descent into La Jolla Canyon is a favorite of runners and hikers, and a fitting end to those traversing the BBT from east to west. My run this morning was to the Ray Miller Trailhead (and back) from Satwiwa, starting at the Wendy Drive trailhead in Newbury Park. 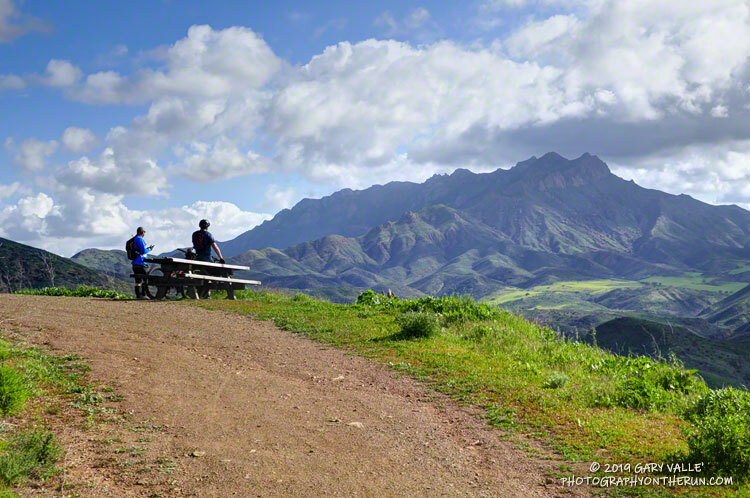 The Wendy Drive Trailhead is very popular and is the starting point for many good runs, hikes and rides. To get an idea of the route options, see the detailed trail maps on the Pt. Mugu State Park page of VenturaCountryTrails.org. Today I was looking to do a longer run, so didn’t take the usual route. On the way down Big Sycamore Canyon, I skipped the turns at Wood Canyon (Hell Hill), Wood Canyon Vista Trail (BBT) and Fireline Trail and at Overlook Fire Road, some eight miles into the run, finally headed uphill. View of the Pacific, Anacapa Island and Santa Cruz Island from the Ray Miller Trail. The top of the Ray Miller Trail is a stout 2.5 -mile climb from the bottom of Overlook Fire Road. Along the way there were excellent views of Sycamore Canyon, Serrano Valley and Boney Mountain. About a half-mile down the Ray Miller Trail there is a popular overlook of the coast. The day was clear and there were stunning views of the Pacific and the Channel Islands. Brushed by whispers of wind, the cerulean blue Pacific filled my view for much of the descent to the parking lot. It was an odd feeling to run down to the parking lot with runners who were cheerfully finishing their morning run, knowing that I had many more miles to go. After a quick stop at the water spigot, I turned, and sighed, and took the first steps back up the hill and toward Satwiwa. For the last couple of days of January, all of February, and the first third of March, the temperature at Downtown Los Angeles (USC) and many other Los Angeles area locations did not reach 70 °F! Will have to think of days like today when it’s 100 degrees and I’m picking foxtails out of my socks and shoes! 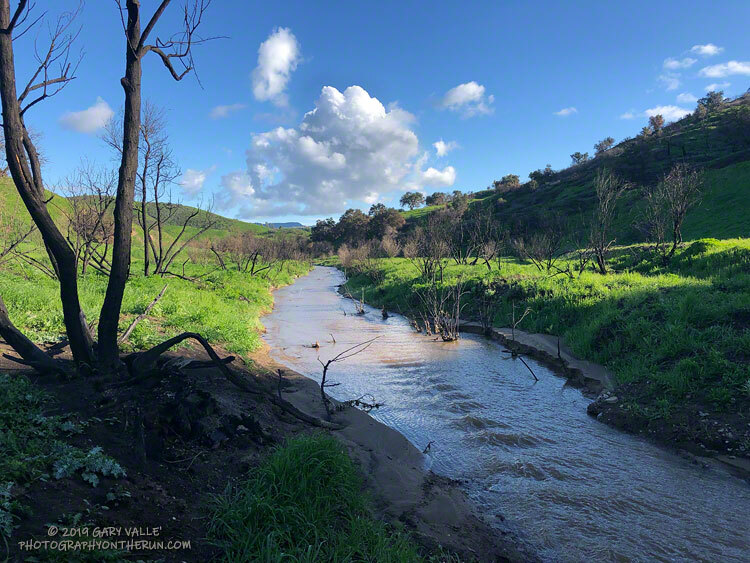 It’s not often we get to hear the burble and gurgle of Las Virgenes Creek in Upper Las Virgenes Canyon Open Space Preserve. Last Winter it didn’t run at all. There were two crossings of the creek on my run today. My shoes were already wet from running on wet trails, so I didn’t worry about keeping my shoes dry. Here’s a video snapshot of the creek on Vimeo. It’s carrying a bit more sediment than normal, as a result of the Woolsey Fire. 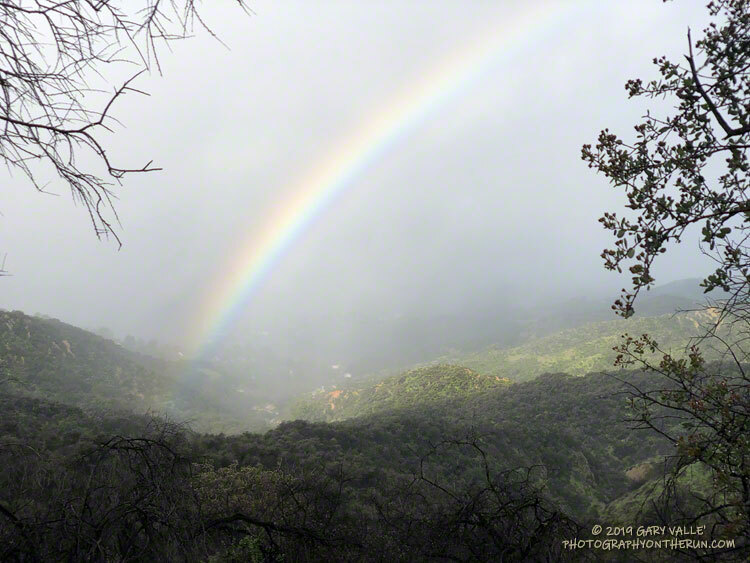 There sure have been a lot of raindrops and rainbows lately. It seems like every run I do my shoes get muddy — and there are even creeks to cross! Last year on this date, Downtown Los Angeles (USC) had recorded only 2.55 inches of rain since July 1. This year we’ve received 16.69 inches, and as I’m sure you’ve heard, there’s more on the way. It may seem like a long time since Los Angeles has been this wet, but actually it’s only been a couple of years. Year before last we’d received 18.5 inches of rain by this date. We need about 1.81 inches of rain from this week’s system to catch up. Recognize this section of the Garapito Trail? See the large embankment along the right side of the trail? 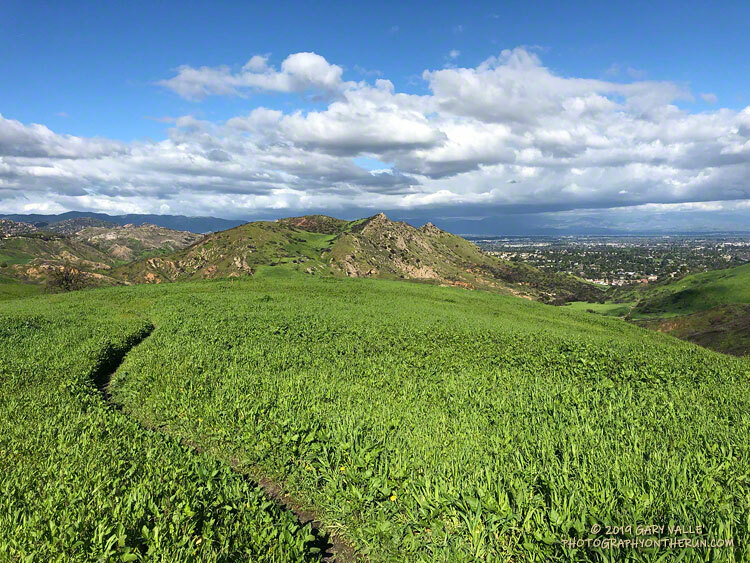 In 2005, during the second wettest Rain Year in LA on record, the hillside slumped around 12′. The trail is on top of the section that dropped. During the 2004-2005 Rain Year Downtown Los Angeles recorded 37.25 inches of rain! 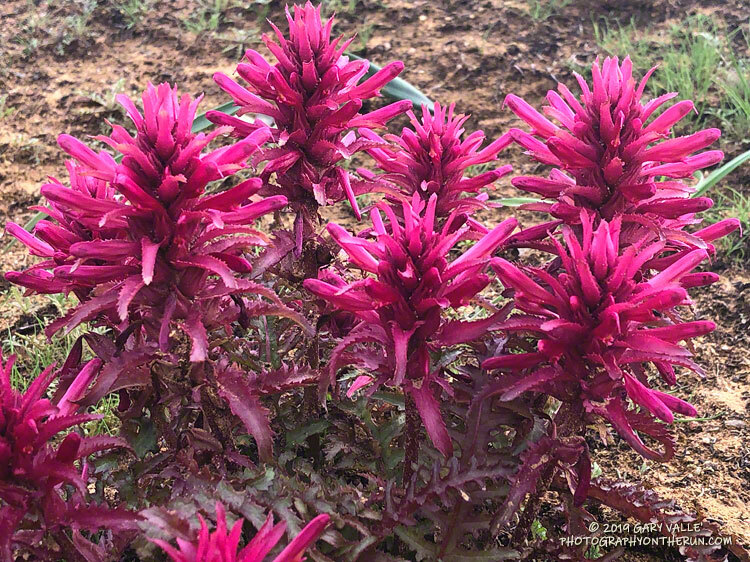 Warrior’s plume (Pedicularis densiflora) along the Cheeseboro Canyon Trail, one of the areas burned in the November 2018 Woolsey Fire. With this rain season’s abundant rainfall, displays of wildflowers will be more extensive than usual and of greater variety — both inside and outside the Woolsey Fire burn area. Some of the SMMTC crew approaching the junction of the Old Boney and Chamberlain Trails. 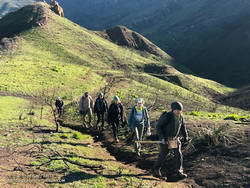 Saturday, 27 trail runners assisted the SMMTC in trail work on the Chamberlain Trail segment of the Backbone Trail. The trail runners were organized by Backbone Trail Utra race director Mike Epler, who recently joined the board of the SMMTC. Ultra race director Keira Henninger volunteered and also encouraged runners to participate. The Chamberlain Trail took a hard hit from the Woolsey Fire and subsequent rains. Under the direction of SMMTC crew members, runners restored washed out and rutted sections of trail and removed burned limbs, rocks and other debris. The trail was restored from its junction with the Old Boney Trail up to Chamberlain Rock. 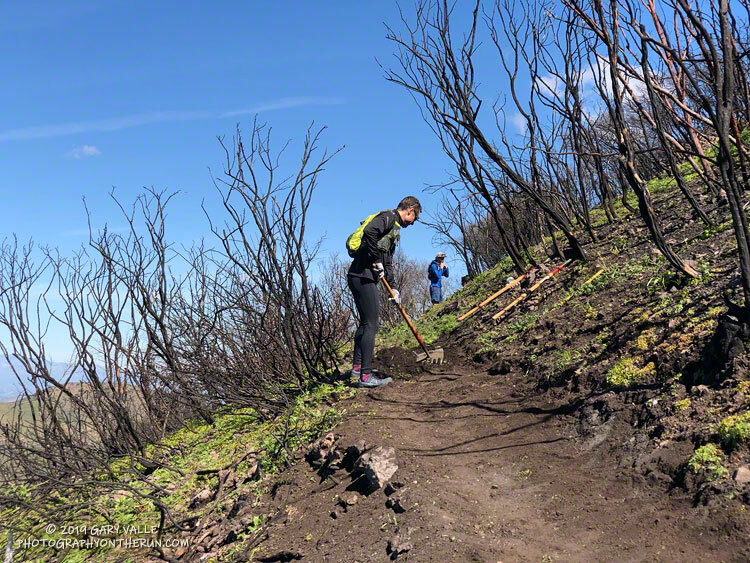 In preparation for future trail work, hundreds of limbs were removed from the trail up to its junction with the Tri Peaks Trail. Many runners ran to the Chamberlain Trail, did the trail work, and then ran back. This was a good way to get in a good long run and contribute to the restoration of the trails damaged in the Woolsey Fire. Additional photos and info are available on the SMMTC Facebook Page and web site.